If you've been here awhile, you know that gut health is something that I have struggled with for the past 15 years. There's nothing worse than the cramping and bloating that comes from an out-of-whack microbiome. Because April is IBS Awareness month, I wanted to talk about gut health today, and a product that I've been using for the past several weeks that has been beneficial in helping me maintain a balanced microbiome. If you're struggling with IBS symptoms, such a bloating, constipation, diarrhea, or stomach pain, Holigos™ IBS may help you reduce those symptoms, ranging from mild to severe. 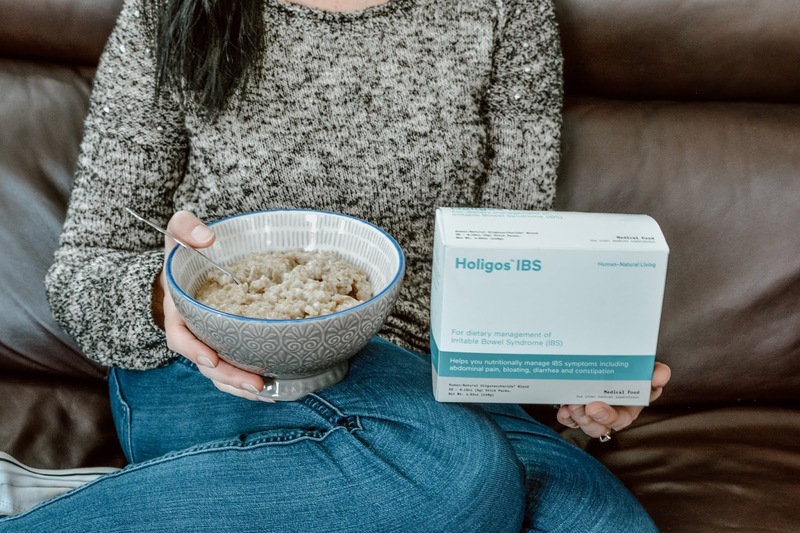 Holigos™IBS is not another probiotic, but a medical food that is added into food or beverage once a day that can potentially help those with IBS manage their condition in a unique way. 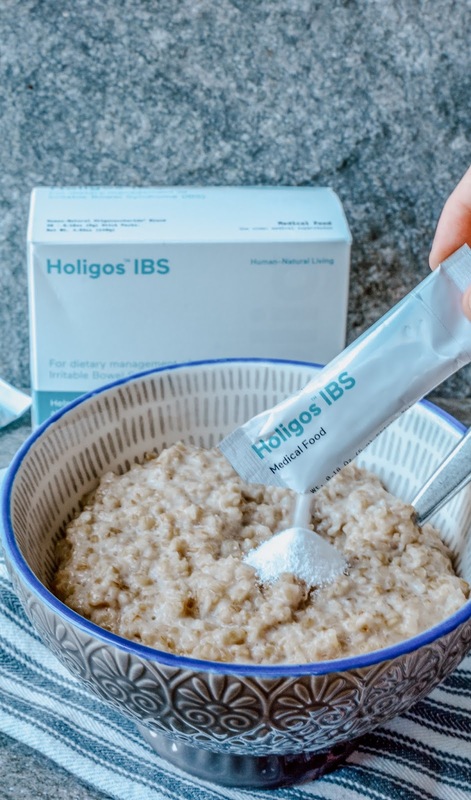 Holigos™ IBS is a new, non-prescription product formulated with Human-Natural Oligosaccharides, which are nutrients unique to the human body as they are similar to those found in the protective lining of the digestive tract and identical in structure to those found in mother’s milk. Our bodies themselves produce these unique compounds which are critical for digestive health. They nourish and support our intestinal barrier by stimulating the growth of beneficial bacteria in the gut. This process helps build strong intestinal barriers and regulate the immune system as well as promote overall digestive and immune health. Research shows that those suffering with IBS have an unbalanced microbiome. The HNOs in Holigos™ IBS are unique in how they selectively feed your own good gut bacteria allowing them to grow and flourish, which makes it hard for the bad bacteria to grow and flourish, limiting their negative impact on the digestive system. A recently completed clinical trial program with Holigos™ IBS, including 300 participants and 25 medical centers here in the US has shown very promising results in IBS symptom reduction. More than 85% of participants showed significant improvement in IBS symptoms after regularly using Holigos™ IBS. Less pain – Days with stomach pain reduced from 4 to less than 1½ over the course of a week. Imagine having 12 days fever with pain in a month. Regular Bowel movement – Instances of constipation and diarrhea reduced by more than a half. Reduced bloating – Bloating severity reduced by more than 60%. Increased quality of life – 55% improvement on measures such as energy and mood. 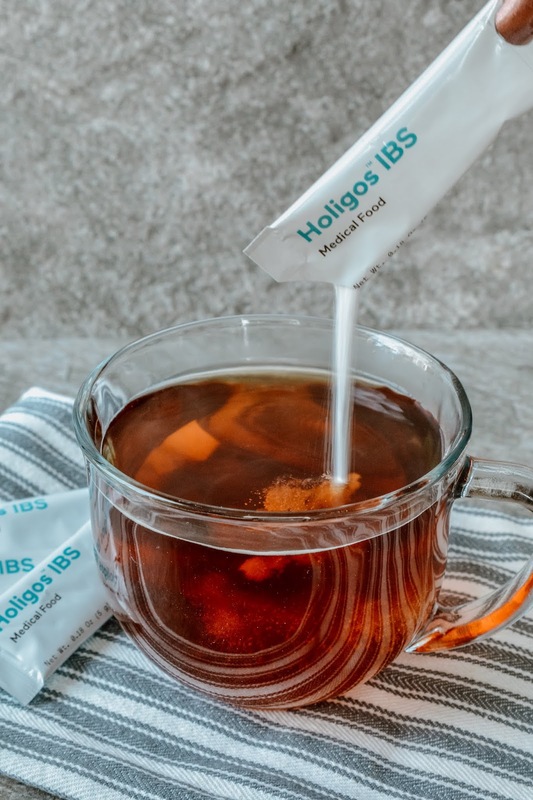 Holigos™IBS comes in convenient single serving packets that are easy to tear open to empty the contents into your food or beverage once daily. It is odorless and tasteless, so you can mix it with any food or drink (cold or warm) that you like without having to worry about it affecting the flavor or texture. I like to mix it into a warm mug of tea every morning, but I have mixed it into my oatmeal without any issues as well. I have definitely seen some digestive improvements since starting Holigos™ IBS, mainly slightly less cramping and bloating daily. I will say that I did notice increased gas and loud tummy rumbling during my first week of use, but that was expected as they were listed as potential side effects while my body was adjusting to using the product daily. However, that has since stopped and I am feeling the positive changes beginning to take place within my digestive tract now. For most people, this should pass within weeks, but for some people, these mild symptoms may last longer. If you do experience more severe symptoms after taking Holigos™ IBS, you should stop taking the product. Holigos IBS does not contain gluten, artificial flavors, colors, yeast, soy and sweeteners. Also, it does not need to be refrigerated, so you can easily take the on-the-go sticks with you on travels as well. 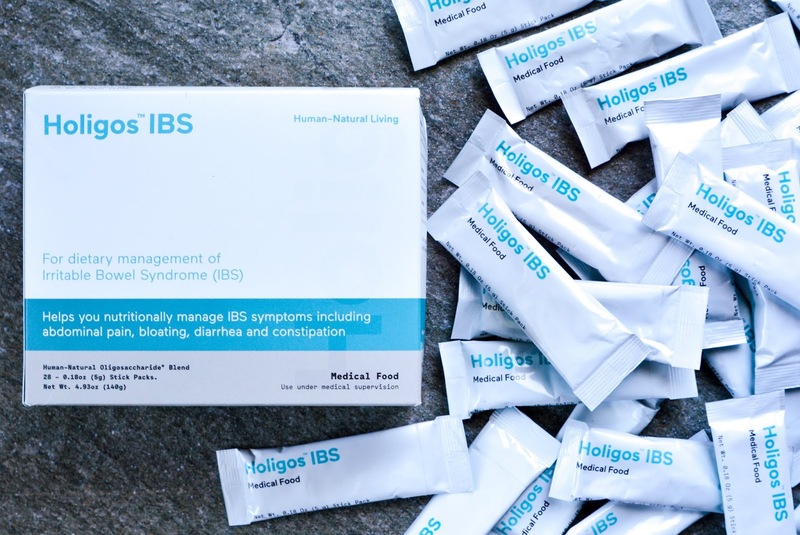 If you suffer from IBS symptoms, Holigos™ IBS might be beneficial in helping to manage those symptoms. You can learn more about all of the benefits of using Holigos™ IBS on their website. Additionally, if you decide to make a purchase to try it for yourself, you can receive 30% off your purchase of Holigos IBS by using code TryHoligos30 at checkout! *These products are not intended to diagnose, treat, cure, or prevent any diseases. Please do your own research before taking Holigos™ IBS to see if it is right for you. How often to you experience IBS related symptoms? Have you been able to successfully manage your IBS? I've never heard of this product. Interesting post. I used to have so many stomach problems. Now looking back I think it's because I couldn't get mucus up. After my surgery I can get too much up. It's gross. When I think about how I probably swallowed it before I'm glad I can get it up and out. I'm sorry you have issues. :( This product looks great. You could even put some in a smoothie. I hope this product continues to help you, Theresa! I had c. difficile once, after problems with a dental/sinus infection and a strong antibiotic. I wouldn't wish IBS on anyone!